London—Wednesday February 20, 2019, 7:30 PM. Fred Landon Library. 167 Wortley Road, London ON, N6C 3P6. Sponsored by the QWF. Victoria—Friday May 25, 2018. Planet Earth Poetry Series. Sponsored by the QWF. Salem, Massachusetts—Saturday, May 5, 2018. Massachusetts Poetry Festival. Hamilton—Thursday, April 12, 2018. gritLIT Festival. Sponsored by the QWF. Montreal—Tuesday, January 23, 2018, 7:30 PM. Visual Arts Centre • School of Art / McClure Gallery. 350 Victoria Avenue, Westmount Tel: 514-488-9558. Montreal—Saturday, December 2, 2017. 5:00-7:00 PM. The Atwater Library and Computer Centre. Reading with Julia McCarthy, for the launch of Museum of Kindness. Montreal—Saturday, November 7, 2009. Read as part of a poetry evening hosted by the Modernist Studies Association annual conference. Montreal—Monday, April 6, 2009. Thomson House, 3650 McTavish Street (McGill campus). Participated in a bilingual round table on the theme “Teaching Creative Writing in a Multicultural Context / Enseigner la création littéraire dans un contexte multiculturel,” moderated by Stanley Péan. Other participants included Thomas Heise, Mary Di Michele, Robert Lalonde, Yvon Rivard, Monique LaRue and Antonio D’Alfonso. A few short readings (5 minutes per poet/writer) followed. Montreal—Thursday, November 20, 2008. Paragraphe Books (2220 McGill-College at Sherbrooke). Launch of the Best of Canadian Poetry in English, 2008 — the inaugural volume of an anthology guest-edited by Stephanie Bolster (continuing Advisory Editor Molly Peacock). Bar Italia, Toronto, March 18, 2007. Panel discussion with readings—”Poetry as Biography”—with Barry Dempster and Steven Price. Moderated by Maureen Harris. Art Bar Poetry Series at the Victory Café, Toronto, March 20, 2007. The Yellow Door, Montreal, December 7, 2006. Vancouver Public Library, November 3, 2006. Scrivener Benefit Reading, Café Esperanza, Montreal, October 21, 2006. 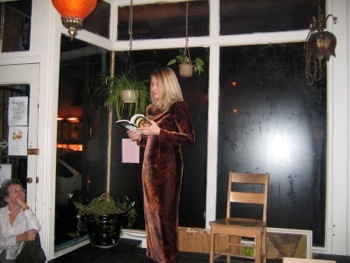 Book launch (I, Nadja, and Other Poems), Café Esperanza, Montreal, October 13, 2006. Zeke’s Gallery, Montreal, April 25, 2006. Hear a recording of the reading by clicking on the link on my links page. CBC Poetry Face-Off, Casa del Popolo, Montreal, February 16, 2006. The Yellow Door, Montreal, September 22, 2005. Dawson Voices, Dawson College, Montreal, April 2004. Poetry 101 Reading, Gallery 101, Ottawa, June 12, 2003. Reading and discussion with Claire Rothman’s Creative Writing class, Marianopolis College, Montreal. Sponsored by the Canada Council. April 24, 2001.
a night of above/ground. Café Sarajevo, Montreal. April 9, 2001. Montage Benefit Reading, Blue Dog, 3958 St Laurent, Montreal. November 27, 2000. The Yellow Door, Montreal. April 27, 2000. Blizzarts, Montreal. (Launch of Faizal Deen’s poetry collection, Land Without Chocolate). April 16, 2000. Poetry @ Lunch Reading Series, Rare Books and Special Collections Division, McGill University. March 24, 2000. Women’s Show, Shorer Gallery, Montreal. July 15, 1998. WHIPlash Poetry Festival, Saw Gallery, Ottawa. June 19, 1998. Mainlines Reading Series, Fauche le Vent, Montreal. June 15, 1998. Women’s Words Reading, Isart, Montreal. March 29, 1998. The Yellow Door, Montreal. September 27, 1997. Mainlines Reading Series, City Pub, Montreal. July 7, 1997. Reading at the book launch for I, Nadja, and Other Poems, October 13 2006, at Café Esperanza, Montreal.